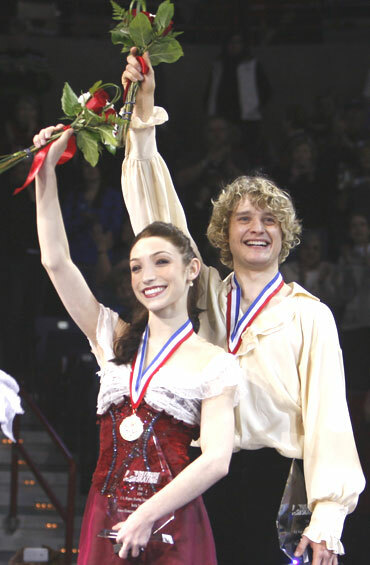 Meryl Davis and Charlie White have been ice-skating together since they were nine. The 2009 US National Champions in figure skating are now eyeing the February Winter Olympics in Vancouver. Last year - as they were excelling in their sport, winning accolades at home and abroad, the 22-year-old skaters, both undergraduates at the University of Michigan, were looking to add some spice and a touch of originality to their routine on the ice. Then one day their Russian coach Marina Zueva saw a bright coloured scarf with Indian dancers on it in a Hermes store. Zueva was exposed to Hindi films and music in Russia, and she knew she had found the key to what would add freshness to Davis and White's performance, especially in their Original Dance routine. "We have done a lot of ballet, some Russian traditional dance, waltzes and a lot of very typical ball room type dances on the ice," White recently said. But Zueva visualized the two on the ice moving to Bollywood tunes and dressed in colourful Indian outfits. "She thought it would be something different," Davis said. "Not a lot of people had performed with Bollywood music on ice. And she felt our personalities might translate well into this type of movement." Davis's mother had read about an Indian-American Bollywood fitness dance instructor - Anuja Rajendra in the Ann Arbor area. And thus began a friendship and a collaboration that has resulted in a huge interest in Davis's and White's figure skating routines. Their YouTube videos have been seen over 200,000 times, especially in India. "I got a call from Meryl's mother," Rajendra said from Ann Arbor. "She was very sweet and modest, and said her daughter and her skating partner Charlie were thinking of doing an Indian dance. She added that they had some upcoming competitions, including the Olympics. And she asked whether I be interested in working with them." Rajendra, 37, is a trained Bharata Natayam dancer and a mother of two young children. She runs several popular dance/fitness classes in the Detroit and Ann Arbor areas, called BollyFit. Rajendra launched BollyFit in March 2007 - in memory of her late sister, and also because she was meeting mothers who had gained weight during their pregnancy. When Davis and White visited Rajendra's studio in Ann Arbor she danced a few moves for them as they watched her. "They would stand behind and dance with me," she added. "So that's how I taught them steps and different dances, things that I have choreographed over the years, getting them a feel for the music, the culture and the movies." She felt that since they were going to represent the US in the Winter Olympics, they should plan on something classy. "Anyone can put on music and there are steps that are not in my style," Rajendra said. "I felt that if it was going to represent India and its culture then it had to be something special. The steps I taught them were geared around that." For Davis and White this was all very new. "We told her we basically don't know anything about Indian dance," White said. So Rajendra introduced them to hit Bollywood songs from films like Devdas and Bunty Aur Babli, shared DVDs and even pointed them to YouTube videos of songs from the films. "We were all trying to see what our coaches liked best and what would translate on the ice," White added. Rajendra started the dance with White standing as if he was holding a flute like Krishna. In that brief moment Davis was Radha. The opening segment then starts with Kajra Re from Bunty Aur Babli. In the middle section, where Davis and White have to do certain required elements of the performance, Rajendra introduced the song Silsila Yeh Chahat Ka from Devdas. After approximately three months of practice in her studio, Rajendra started visiting her students at the ice rink. "On the ice the foot movements do not translate to the songs, so we wanted to make sure that the hands and upper body movement were authentic," she said. In their routine, first performed at a competition in Germany, Davis and White wear Indian clothes. "My mom got some Indian wedding fashion magazines and looked through the pictures," Davis said. "We had an idea to give a modern look to the old costumes." They shopped at an Indian clothing store called Bombay Boutique in Detroit, bought a set of costumes and re-tailored them to make them work on ice. White picked up a sherwani. In Germany people watching the figure skating competition were surprised and then very appreciative. "They definitely were a little bit shocked, because it is so different for a team to have such an authentic rendition of an Indian dance," White said. "They were new to it all. The great thing about a lot of Bollywood dances is that they are very accessible and easy to get into. People heard the music and there were a lot of good movements. So it is hard to deny how great it looked on the ice."